Santa Cruz County – List of Stone Quarries, Etc. Santa Cruz County Stone & Building Resources (circa 1867) – Excerpts from Mineral Resources of the States and Territories West of the Rocky Mountains, by J. Ross Browne, Report to the Committee on Mines and Mining, House of Representatives During the Second Session of the Fortieth Congress, 1867-1868, Ex. Doc. No. 202, 1868. Santa Cruz County – Limestone (historical times through circa 1906). Excerpts from The Structural and Industrial Materials of California, Bulletin No. 38, California, State Mining Bureau, San Francisco, California, 1906. Santa Cruz County Limestone & Marble Resources (circa 1913) – Included in chapter in “California,” by G. F. Loughlin, in the Mineral Resources of the United States Calendar Year 1913, Part II. Nonmetals, United States Geological Survey, 1914. 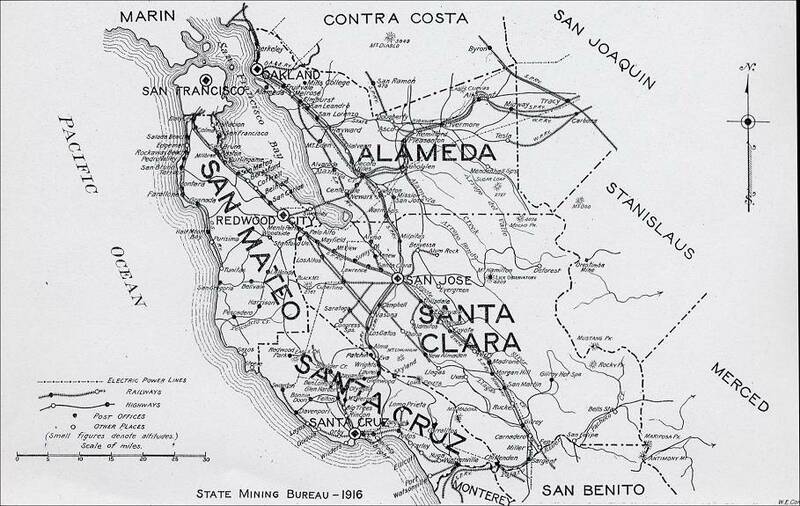 Santa Cruz County Mineral Industry (circa 1919) – Excerpt from California Mineral Production for 1919, Bulletin No. 88, by Walter W. Bradley, California State Mining Bureau, 1920. Santa Cruz County Limestone and Marble Industry and Deposits (through 1947) – Excerpts from “Limestone in California,“ by Clarence A. Logan, California Journal of Mines and Geology, Vol. 43, No. 3, July 1947, California Division of Mines, San Francisco, California. Henry Cowell Home Ranch, 1790’s to 1947, in Santa Cruz County (Lime and Limestone) – Excerpts from the Application for Federal Historic Registration of the Cowell Home Ranch in Santa Cruz by David Eselius. Photographs of the Henry Cowell Ranch Buildings and Lime Kilns in Santa Cruz. Photographs of the Henry Cowell Upper Marble Quarry and Lime Kiln on the University of California, Santa Cruz Campus. Photographs of the Henry Cowell Lower Marble Quarry on the University of California, Santa Cruz Campus. Photographs of the Fall Creek/I. X. L. Lime Company/ Henry Cowell Lime Kilns. Santa Cruz County Limestone (historical times through circa 1906) – Excerpt from The Structural and Industrial Materials of California, Bulletin No. 38, California, State Mining Bureau, San Francisco, California, 1906. "There are extensive beds of limestone northwest of the city of Santa Cruz. Four quarries are now operated in these deposits. The stone is a coarsely crystalline blue, and in places white limestone, much broken and shattered, and is overlaid by a dark brown and in places black adobe clay. The limestone is generally stained yellow and brown on the surface along the fissures by the clay and iron carried down by the percolating waters. With the exception of this surface stain, the stone appears to be quite pure carbonate of lime. The texture is more variable than in many other localities; part of it is quite coarsely and part of it finely crystalline. "The stone has been used to some extent for rubble work in retaining walls and foundations and for macadam in the streets of Santa Cruz, but more of it has been burned into quicklime and shipped to San Francisco and elsewhere, besides that used locally." Location: Bordering Pacific Ocean, just south of San Mateo County. "The mineral output of Santa Cruz County, a portion of which is itemized below, amounted to a total value of $2,245,056, giving the county a standing of fifteenth among all others in the state in this regard. Santa Cruz County, 1916 Map, from California Mineral Production for 1919 (with County Maps), Bulletin No. 88, by Walter W. Bradley, California State Mining Bureau, San Francisco: California State Printing Office, 1920, pp. 189. "The important deposits of Gavilan (pre-Franciscan) limestone in Santa Cruz County are within 8 miles northwest of the city of Santa Cruz, and for years production has come partly from within the city limits. The limestone is associated with a micaceous schist of similar age and is considerably folded, crushed and generally altered to a fine-grained gray-mottled marble or coarsely crystalline blue to white calcite marble with minor amounts of impurities. These deposits have made the county one of the more important producers of limestone for cement, lime, and miscellaneous uses. There are about 14 deposits, of which 8 or 9 are large enough to be important, in two areas of a few square miles each on the south slope of Ben Lomond Mountain between San Vicente Creek and San Lorenzo River. The limestone and associated larger areas of schist lie on the quartz diorite (Montara granite) of the mountain, or are partly embedded in it. The area geology has been mapped by Branner, Newsom, and Arnold (09). * Edwin C. Eckel (33)** estimated the total exposures of Gavilan limestone here as between 600 and 700 acres, and he regarded the present separate deposits as parts of what were formerly larger beds that were intruded by the quartz diorite. The accompanying schist has evidently protected the limestone from intense contact metamorphism except in a few places. "In recent years (since 1927) five lime or limestone producers operated in the district. Only three of these have been steady producers. The production of lime in Santa Cruz County was started by I. E. Davis and A. P. Jordan in 1851. In 1867, it was said that 100,000 barrels of lime was used annually in San Francisco, three quarters of which was 'obtained from the vicinity of Santa Cruz on the ranch of the Cañada del Rincon' (Browne, J. R. 68). * There has therefore been a large production from the county for which the Division of Mines has no complete record, as the systematic collection of such statistics by the State Mining Bureau did not begin until 1894 for Santa Cruz County. From 1894 to 1929 the total lime output was 6,113,983 barrels, valued at $6,606,998. Since then, with only one or two producers, figures for output have not been published in detail in order to not reveal details of private business. However, over a long period of years it is safe to say that the county produced from a quarter to a third of all lime made in California. For 10 years past there has been only one lime producer in the county. Most of the limestone quarried for other purposes has been used by one portland cement plant with a capacity of 10,000 barrels a day. Several companies have participated in limestone production for miscellaneous uses. "The following analyses of Santa Cruz County Gavilan limestone were quoted from Eckel (33). * Samples 1 to 5 inclusive were taken by Eckel and analyzed by H. R. Brandenberg (Cowell Portland Cement Company). Sample 6 was taken and analyzed by C. A. Newhall. "The reserves of limestone in this region are quite large, and are capable of supplying limestone at recent rates of production for a long time in the future."